A big cornice on Aonach Mor, Lochaber. Scotland’s mountain experts have issued a warning about the dangers of cornices after one was spotted on a Highland peak. Cornices, like the massive ledge of snow spotted on Aonoach Mor in Lochaber this week, occur when the wind whips up snow and can collapse under their own weight and cause avalanches, often during a thaw. The warning came as the avalanche tally hit the landmark figure of 50 for the season so far – but with hopes that the risk will decrease later in the week once all the current snow is “purged”. The Scottish Avalanche Information Service’s keeps count of reports of avalanches on all of Scotland’s mountains – and also keeps tabs on other features like cornices. 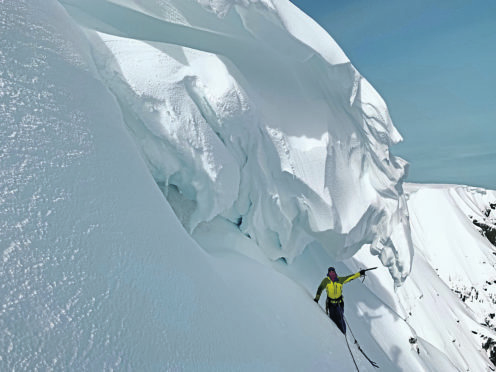 An SAIS spokesman said: “The cornice collapse threat is quite separate from avalanche hazard. “It is a feature than can be unpredictable in terms of when it may collapse, sometimes releasing many hundreds, or thousands in some cases, tonnes of snow onto slopes below. “With the rain and sudden warming the avalanche hazard is significant in some areas today. The country’s vital winter avalanche service for walkers and climbers has now logged its 50th snow slide this season – with warnings of “considerable” risk in three of its five monitored mountain areas. The service recorded 261 avalanches during its 2017/18 season, and it is understood this year has seen a much slower start than the last. There were no fatalities due to avalanche activity recorded during the season, SAIS said. Every winter, SAIS assesses avalanche hazards and provides daily information on the stability of snowpack in the six mountain areas. The areas are Lochaber, Glen Coe, Creag Meagaidh, Southern Cairngorms, Northern Cairngorms and Torridon. Hillwalkers, climbers and skiers use the information to help them plan trips. Yesterday, Glencoe, Lochaber and Creag Meagaidh all had a “considerable” risk of avalanche. Six people have died on Scotland’s mountains so far this winter – but none thought to be due to avalanche. In 2014, there were 18 recorded incidents of people falling through cornices in Scotland’s mountains, prompting Mountaineering Scotland to issue a warning reminding walkers of climbers of the risk.